Yes, it is quite a random post I have to admit but it is a rather significant post, a post of great importance in my opinion. 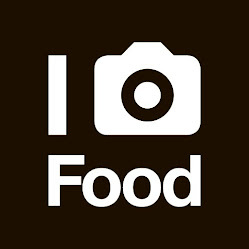 I have been writing a lot of posts on restaurant reviews but in additions to that I do have many rants piled up to be released regarding food and how we treat, value and respect food we often take for granted. I have been doing quite a bit travel over the past 12 months and most involve taking the plane. While I have a lot to say about plane food, both good and bad of course, that would be for another dedicated post. But just to show you the following iPhone picture I took on my way to Guam simply because I want to express the attached comment and what I learned from the meal. "Only when you have experienced the WORST can you truly treasure the simply BAD." It is truly the case! 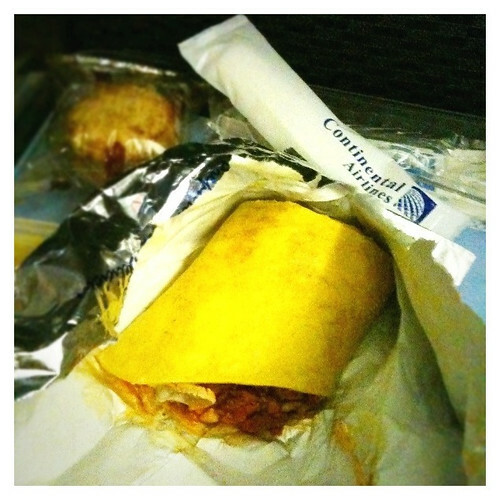 On all the flights I have taken in the past 12 or perhaps 24 months, I realized how much of a food waster I have been! No matter how bad or bland the plane food are, I usually try my very best to finish them with a bit of courage as well as respect for the food; however, I cannot recall the last time I ever touched the packet of salt and pepper! When was the last time you used that packet of salt and pepper? No matter it was breakfast, lunch, dinner or snacks, as long as forks and spoons are provided, you will get that packet of salt and pepper sitting there feeling left out! Salt and Pepper packet has to be one of the greatest if not top 5 items of highest wastage for the airline industry in my opinion. The untouched packets being served in each meals are more likely then not being trashed together with other untouched food like bread or small packets of butter! 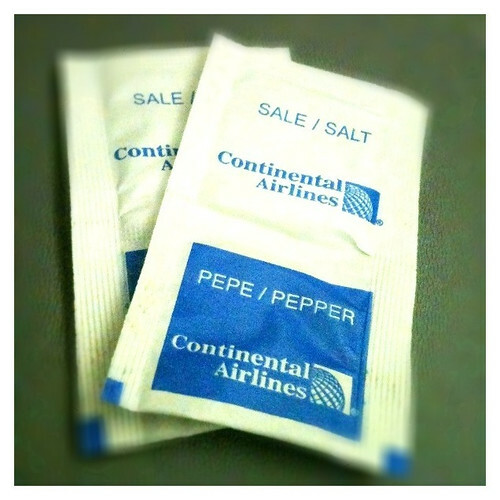 If chance permit, I do like to do a survey on the amount of salt and pepper wasted each year from the airline industry alone. It is often this sort of minor things or items that we often overlooked, at the same time, it is often these minor little things which with little effort can change a great deal for the environment as well as our future supply of food! Many may not care or know how salt and pepper are produced / harvested but to my knowledge, salt used to be a significant items much sought after a couple of hundred years ago due to the difficulties in obtaining them and how they were good for food-preservation in those times. It may not matter to many the history of salt but we should pay some respect and try our best to minimize the wastage whenever possible! I usually keep the packs of salt for treating ulcers in the mouth which are sadly quite common when I don't have sufficient sleep. Sometimes I keep the pepper too for using at home. Quite convenient, i'd say. I always use the pepper, and sometimes even the salt. I find airplane food due to the altitude very bland I have to add it.